Bite-sized chunks of premium chicken breast in a zesty sweet chilli sauce. After trying the Chop Chop! 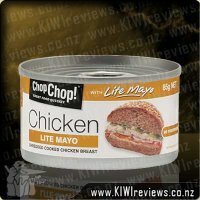 Chicken - Shredded with Lite Mayo and falling in love I went straight back to the supermarket and bought a can of Chop Chop! Chicken - Sweet Chilli, hoping it would be as yummy as the first can. I love Sweet Chilli flavour and though I wasn&apos;t disappointed with the flavour I was disappointed at the teeny tiny little cubes of chicken that seemed to never stay in the sandwiche or on a cracker. 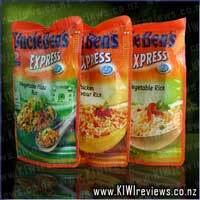 But perfect when mixed through rice and or vegetables. Chop Chop! Chicken - Sweet Chilli is the perfect quick snack option to take for packed lunches, and/or mix through a salad on the spot so all the ingredients stay fresh until right before eating. Again I wish the cans were bigger as the chicken is so yummy and tasty...but I am just greedy when it comes to finding and eating yummy food that I like. 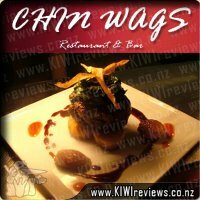 With many flavours to choose from all tastes can be accommodated, and many meal options can be thought up, the only limit is your imagination!! Go out and try some Chop Chop! Chicken now...you won&apos;t be disappointed. The Chop Chop Chicken- Sweet Chilli had lots of sauce which I tipped down the drain to avoid the inevitable mess and soggy sandwiches. The chilli sauce tasted the same as the chilli sauce in tinned tuna although there weren't any chilli pieces in it. It was spicy enough for me. If it had been any hotter I wouldn't have enjoyed it. I found the chicken chunks weren't as convenient for me as the Chop Chop shredded chicken. It would have been ideal for adding to a salad but for sandwiches I had to break up before putting on the bread. 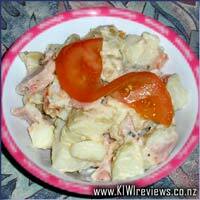 Tinned chicken is ideal for the lunchbox or a picnic as it doesn't require refrigeration like most cold meats. 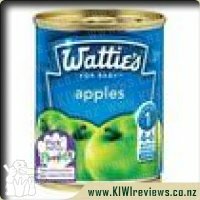 It would also be great for tramping or your Civil Defense emergency kit as there is no preparation involved and the pull ring means you don't have to have a tin opener handy. This was easily my most favourite of the flavours. The taste was perfect, the freshness perfect, the texture perfect, I just wished the tin was bigger. 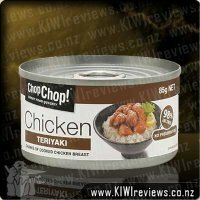 I have told so many people about this range and everyone thought I was crazy, "chicken in a can??" and I must admit I thought the same, I have always had my chicken hot and the thought of having it straight from a can didnt seem right but I have been proven wrong. 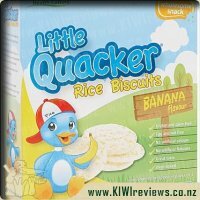 I am now a regular buyer of this wonderful range! Certainly one of the nicest of the range I have tried, it surprises me that this isn't more commonly known in the market. Clearly it has been around a while, and has a good market otherwise it would not have stayed on the shelves, but I find it remarkable that such a great product is still so restricted in it's exposure. This was, for me, a very tasty way to start the day, with the chunks of fresh, tasty chicken in their sticky, delightful sauce, on freshly toasted pita wedges with a thin slice of Parmesan cheese and some fresh NZ butter. The whole can was gone well before I was feeling satisfied, so I continued breakfast with another can of a different flavour. I do think that of the two varieties, the shredded was more versatile, and would have given more meat in the can, so perhaps trying this flavour in a shredded variety may warrant further "testing" in future. Please do keep me in mind to be part of your test panel, Davies Foods. 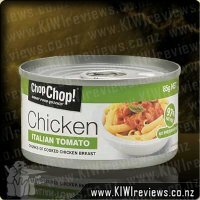 In summary: My personal "hit pick" for the chicken range. I understand there is a Tuna range too, which would certainly justify another morning testing session. 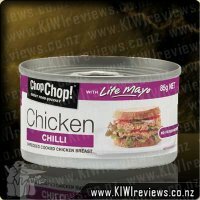 I have been lucky enough to review all the flavours in this Chop Chop! chicken range and honestly the hardest part with reviewing them is saying something original about each one. What I want to say is "They are all sodding fabulous you are crazy if you don't keep a stash of these in the pantry!". Apparently I should write something more original and drooling just doesn't convey it. Ok. Awesome freshness! Awesome taste! 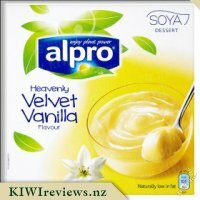 I love things with a little kick so I am a fan of this flavour all right! 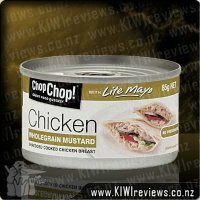 These cans are great to have on hand for sandwich or pita pocket fillings. I have also stubbornly mashed them up to add to my home-made sushi. If I needed a really easy one person meal I could also add this to a little rice and it would be perfect! 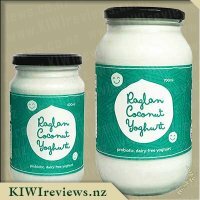 Despite not being my favourite from the range we tried, this was certainly still a very tasty product. The flavour of 'Sweet Chilli' always has me thinking of "sweet and sour sauce" from the Chinese takeaway... well, this was nothing like that! With a really smooth but spicy flavour, this was still ranking right up there for me, despite not hitting all the boxes for me. The fact that the chicken was in chunks made them really easy to serve on crackers with cheese and a bit of fresh basil to round off the flavour combo. -mmmmm- A great way to start an afternoon before the BBQ got fired up. 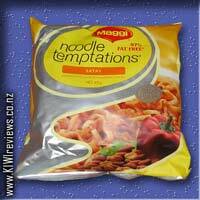 I also thought these might go well in Ravioli, but alas didn't get a chance to try that idea out, as it was all gone before the idea came to me... I am thinking it will be on my next shopping list for sure. Overall, this was really quite a pleasant surprise, and one I plan to introduce to many other people as time goes on. Frankly, I am shocked it has taken this long for me to find out about it! 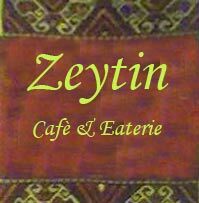 Located on popular Maunganui Road in the Mount, Zeytin Cafe and Eaterie will give you the impression that you have stepped into a fashionable Istanbul cafe.